East St. Louis Trinity UMC has been working to find ways to grow its Sunday School program while at the same time looking for ways to embrace the community. The church made a decision to take Sunday School to where the children are – at school. The congregation donated 30 coats to warm the school children this past Christmas and served more than 400 children and their parents at the Lilly Freeman Elementary School. Pictured in the photo are Rev. 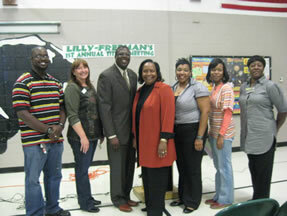 Robert Freeman, the school’s principal and members of the school’s Parent-Teacher Association. And Trinity has also been the recipient of assistance. Junior and senior high youth from Bartlesville, Okla. First UMC spent spring break painting four classrooms and the church’s southeast basement area. University of Illinois graduate library students are also helping to design and install computers, youth friendly desks to enable the church to teach Sunday School in a new way. The church is collaborating with Cokesbury to find ways to use digital media in the Sunday School program.